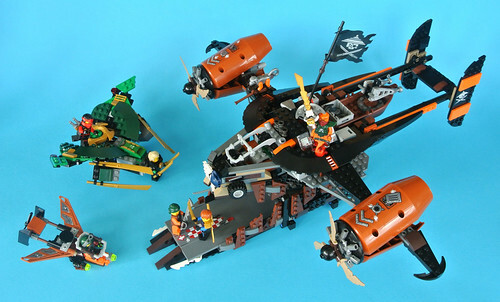 The NINJAGO team is taking to the skies this year and the largest set belonging to the Skybound subtheme is 70605 Misfortune's Keep, priced at £69.99 and containing 754 pieces as well as six minifigures, including three ninja and the exclusive Djinn Nadakhan! This set stood out to me at once, combining the ramshackle nature of a pirate galleon with a steampunk vessel of some kind. The essence of this design is prevalent throughout all of the pirate craft in the latest wave and they therefore look fairly uniform despite their cobbled together appearance.